CINCINNATI — In June, 2018, gunshots rang out on East Clifton Avenue in Over-the-Rhine, claiming the life of Thomas Maul Jr. just days before his 22nd birthday. Months later, police still don't know who pulled the trigger that night, and Maul's family is still searching for answers. 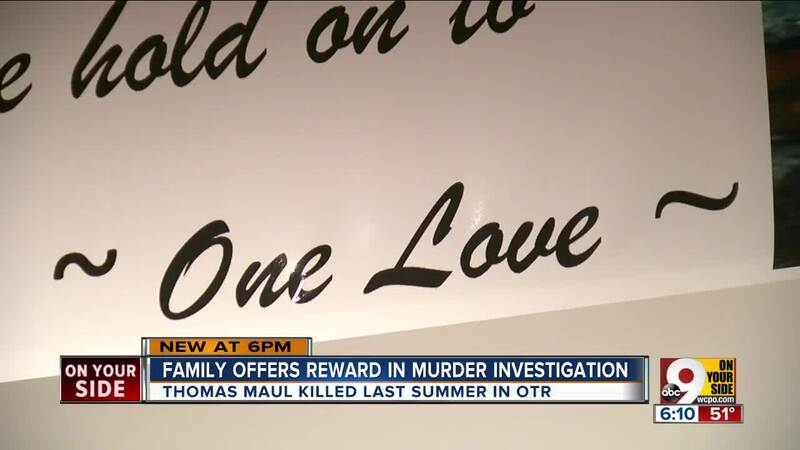 Maul's family gathered Sunday at his aunt's home in Delhi to offer a reward for any information that can bring his murderer to justice. "I miss seeing him every day," said father Thomas Maul Sr. "He was the most important thing in my life and he was my only child." The family is offering a $10,000 reward for information that can lead to the arrest and conviction of the person who shot Maul that night. "It's been very frustrating and there's been minimal progress," said Maul Sr. "We really want to have a suspect and bring justice." The family hopes a reward might entice members of the community who know something about the shooting to come forward. They say their son was a happy and helpful child growing up, who did not deserve to die the way he did. "He went down on Vine Street and fed the homeless with my sister," said Maul Sr. "The name of the organization is Tri-State Caring Souls. He was there every Saturday." Anyone with information on the Over-the-Rhine shooting, is encouraged to call Crimestoppers at 513-352-3040.